With its fine texture and tolerance of close mowing, West Coast Turf’s “Old-Line” Tifdwarf has been the most popular greens-quality hybrid bermuda for decades. It offers fast putting speeds and true ball roll for high performance, comparable to many bentgrass greens. 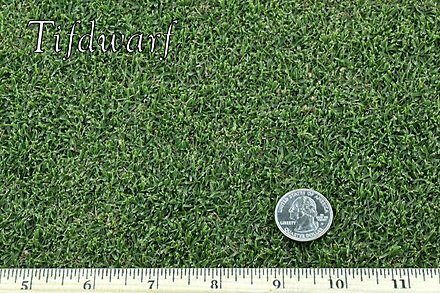 “Old-Line” Tifdwarf is more compact and finer bladed than Tifgreen, needs less maintenance than TifEagle, takes overseeding well, and recovers quickly from injury. Beautiful dark green. Darker than Tifgreen. Fine and smooth. Finer than Tifgreen. Bentgrass greens performance, but with greater heat tolerance and disease resistance. Provides fast putting speeds and true ball roll. Tolerant of poor water quality, foot traffic, and drought. Excellent root system, compact form and vigorous growth habit promote quick recovery from injury. Maintains good color at low mowing heights. Regains color early in spring. Not shade tolerant. Requires full sun all day.